Since the turn of the 21st century, stand up paddle boarding (SUP) has been on the rise. There are a number of elements that go into this sport and for a beginner it can sometimes be quite overwhelming. Whether you are a self-teaching type of paddler, or if you’re looking for basic instructions, this guide will help walk you through the ins and outs of SUP and have you riding the waters like a pro in no time! 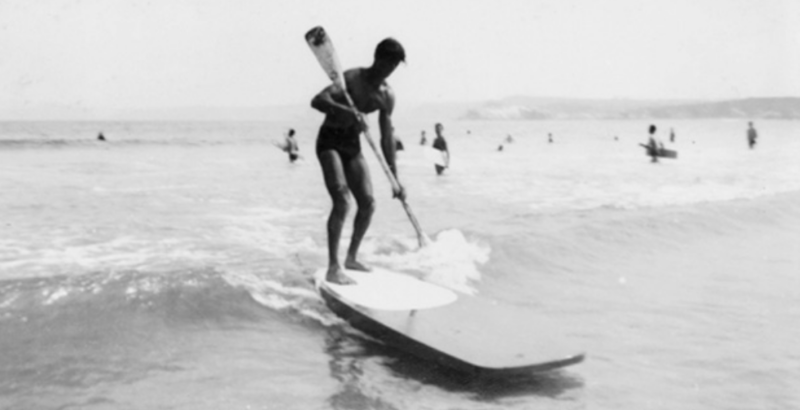 SUP has been around for thousands of years, but it wasn’t truly considered a sport. There were forms of stand up surfing that are found around the world, from African to Mayan cultures, but they were born of necessity, not of sport. Looking at SUP as a recreational pastime and a competitive sport, the origin is much clearer to pinpoint. On September 12, 2002, Hawaiian native Laird Hamilton rode a 6 foot wave in Malibu while standing on a board with a paddle atop an American flag. For the SUP community, this iconic image marks the start of SUP as a sport and pastime. 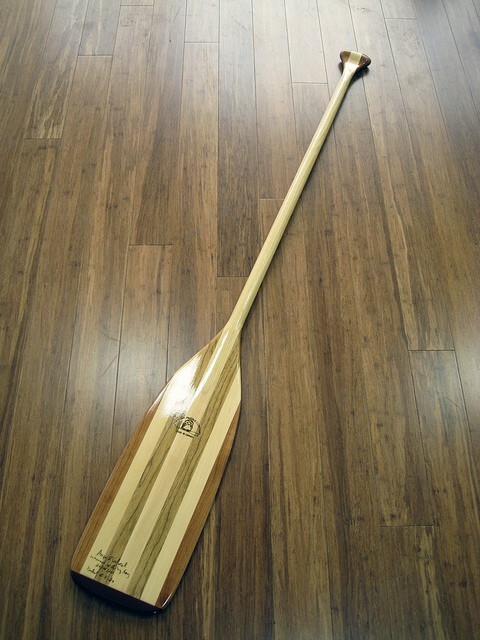 Stand Up Paddle boards come with two types of hulls: planing or displacement. A planing hull is flat and wide which makes it fairly maneuverable. It is a little slower, but it is ideal for leisure paddling, surfing, SUP yoga and whitewater. 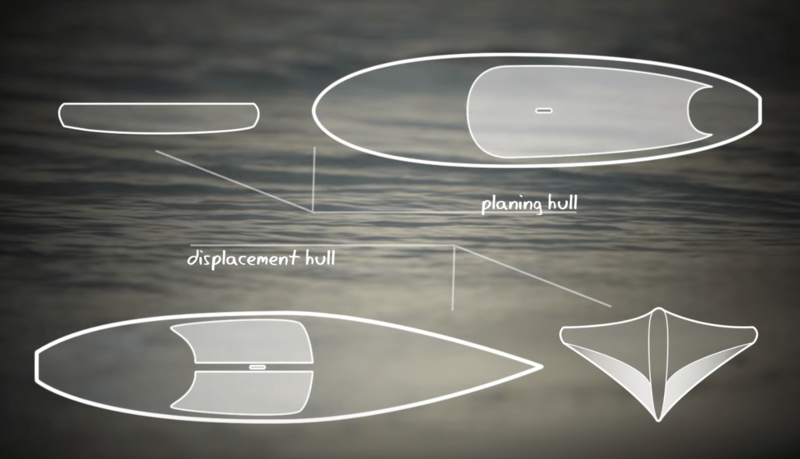 A displacement hull has a more pointed tip (like a kayak or canoe), designed to cut through water for a fast ride. These types of boards are faster, but don’t have as much maneuverability. Displacement hulls are recommended for fitness paddling, SUP touring/camping, and competitive racing. After selecting a hull type, you have the option of either an inflatable or solid board. 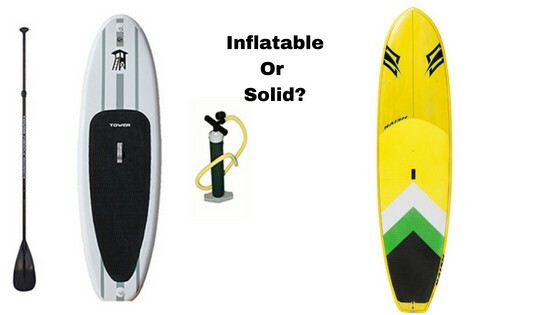 Inflatable boards are great for traveling, hiking, SUP yoga, and/or if you have limited storage space. On the flip side, if you do have space to store a full-size board, solid boards offer greater stability, better performance, and come in a wider range of sizes and shapes. Typical SUP boards come in three different lengths: short, medium, or long. 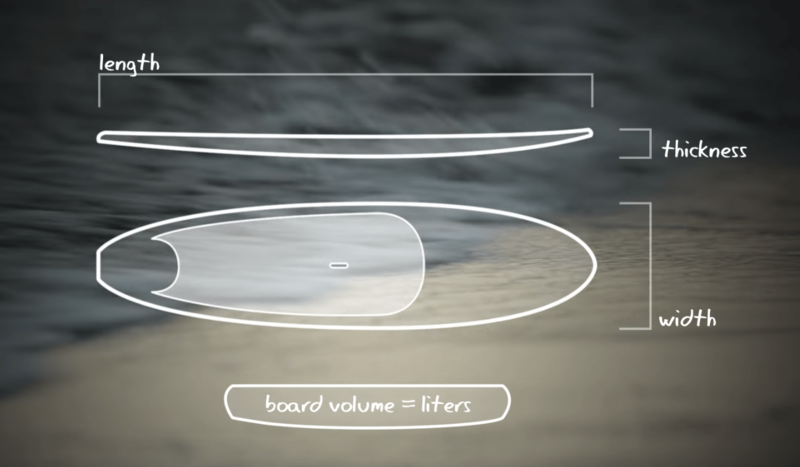 The length will impact how the board handles and will also determine what kind of a hull-type you can select. – Short boards are under 10 feet and are recommended for kids and standard surfing. These always have a planing hull and are highly maneuverable. – Medium boards range from 10-12 feet and are the most common boards for recreational SUP and SUP yoga. Generally these boards have planing hulls as well, but you can find some with a displacement hull if needed. – Long boards are 12ft,6in and longer. They are great for long-distance paddling, touring and have the best speed. These are almost all made with displacement hulls and generally are the thinnest, straightest looking boards. One of the final pieces of the board is the width and thickness. Generally, if you’re a smaller person, your board should be thinner and if you’re a larger person the board is wider. This is due to the balance of weight. The only exception would be when you’re starting out – the wider the board the more stability you have. So even if you’re on the smaller side it may make sense to go with a wider starter board as you get used to standing. In regards to the board’s thickness, it correlates with overall volume. Generally, the smaller the paddler, the thinner the board can be. The final thing to consider when choosing a board is the right fin setup. Fins attach under the back side of a SUP board and are designed for either stability or maneuverability. The smaller the fin, the better maneuverability; the larger the fin, the better stability. In general, the fins are removable and paddlers can swap out their fins based on their activity and needs. Regardless of your board type (inflatable vs solid), the following fin styles can be attached. The only exception is that with inflatable boards the material is either rubber or some other type of a semi-rigid fin. Single fin – this style is good if you plan on doing flat water paddle boarding. It screws into the fin box and has good tracking and it doesn’t drag too much. 3-fin style (thruster) – this is a combination of three fins that attach to the underside of your SUP board. 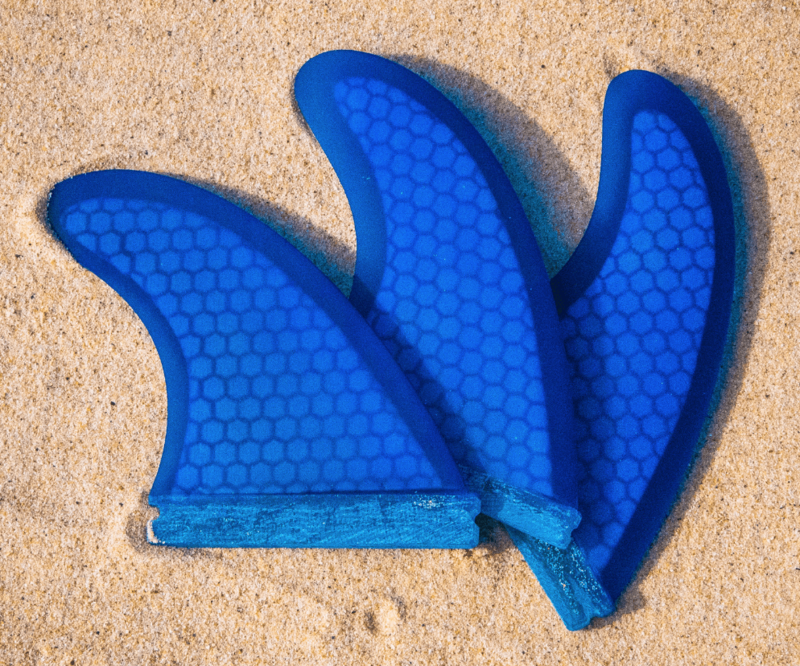 These provide tracking in flat water and also can handle surf. 2+1 style – this has one large center fin, flanked on both sides by smaller fins. This is the most common setup designed for SUP surfing. Stand up paddle boarding would not be the same without a paddle. Choosing the correct sup paddle is just a critical as choosing the correct board because both are needed to make SUP enjoyable. Like the SUP boards, there are a few things that come into play when selecting the correct paddle. When selecting the material for your paddle it is important to consider how frequently you will be paddling and for how long each time. The longer you plan on paddling, the lighter you will want your paddle to be. Additionally, the type of material will determine how flexible the paddle is. ● Aluminum – This material is often recommended for beginners. It is not the lightest material used (see Carbon Fiber), but it is on the lighter end of the spectrum. Additionally, aluminum is more affordable than other materials so there is not as much initial investment. Lastly, it is not as stiff as other materials which is better if you have had previous arm/shoulder injuries. ● Carbon Fiber – It is safe to say that this is the best material you can purchase for your paddle. It is the lightest and stiffest for your paddle and is ideal for long-distance SUP due to the efficient transfer of effort into performance. ● Fiberglass – These paddles are a runner up to Carbon Fiber. While not as stiff, this material is quite light and affordable. Paddles made with fiberglass propel your SUP board nicely. ● Plastic – This material is generally used as the blade and grip of entry-level paddles and is then paired with an aluminum shaft. It is affordable and durable. ● Wood – This is no longer a typical material, but can be found. These paddles are often beautiful, but are heavier and more expensive than other materials. Once you get into a rhythm you will find a paddle size that you like. However, for those of you getting started, a general rule of thumb to follow is, “the bigger you are the bigger your blade”. Bigger blades require more strength to use, and more body allows for more control. On the other side, small blades allow for greater efficiency. You move less water, but you conserve more energy while doing so. These smaller blades are recommended for SUP racers or long-distance paddlers. It is also better for paddlers with previous injuries as they are gentler on your body. The shape of the blade can be either rectangular or teardrop. Rectangular blades move less water and make for an all-around easier stroke. Powerful stokes suit teardrop blades better. These are recommended for slower-strokes with more power. The final thing to consider when purchasing your paddle is the offset – this is how much the blade curves forward from the shaft. Like other features of both the paddle and board, this is mostly determined by what kind of SUP you will be doing, as well as what your personal comfort is (which is learned over time). In general however, there are 3 kinds of offsets. 10 degrees – recommended for general SUP and paddling in general. 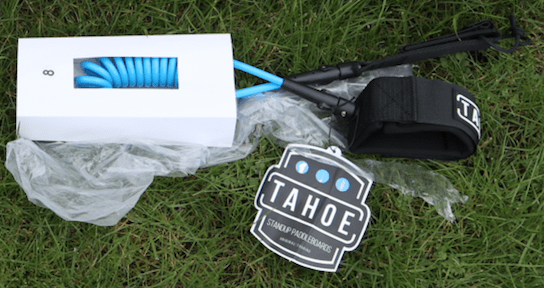 The final part of your SUP investment is a leash. They come in a myriad of lengths and styles and it is recommended to have one that is about the length of your board. They are crucial in the event of a fall – which happens to the best of us – and will keep your board (or you!) from being swept away. As you begin your trek into the world of SUP, here are some tips and tricks (and don’ts) to keep you happy, upright, and paddling in the right direction. Twist your torso away from your paddle and lean away from it as you push – together, these movements will propel your SUP board into a turn. 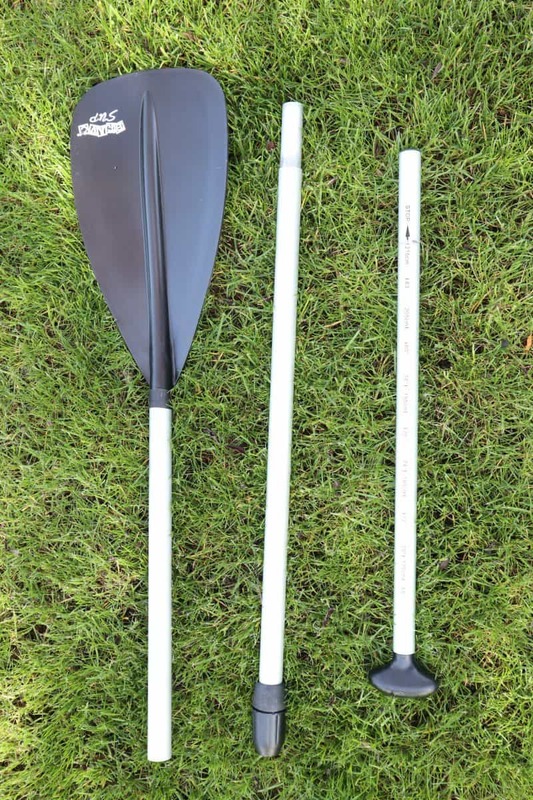 Avoid holding the paddle with both hands on the shaft – it’s not a broom! Avoid standing in a yoga-like warrior pose. To ensure best weight distribution make sure your feet are parallel to each other.